It has now been 150 years since the first dental license was issued to Sir John Tomes. Michigan dental patients should be grateful for the advances made in dentistry during the past 150 years. There was a time when blacksmiths and wig makers would also extract teeth with forceps to make a little extra money. Anyone could call themselves a dentist. Often these untrained people broke the jaws of the person they were trying to help. Ouch! At Stewart and Hull Aesthetic and General Dentistry, we celebrate with the Rockford MI dental community and marvel at the many advances made in the history of dentistry, particularly cosmetic dentistry. One of the modern treatments that has helped countless Belmont, Comstock Park, Grand Rapids, Sparta, Walker and Rockford, MI patients of Dr. Stewart and Dr. Hull is Invisalign invisible braces. This orthodontic therapy is custom made for each patient. They are transparent and removable and will help you achieve your desired smile in about 3 to 18 months. Dr. Stewart’s and Dr. Hull’s training didn’t end when they graduated from dental school and opened their practice in Comstock Park. As cutting-edge cosmetic dentists, we continually attend continuing education courses so we can expertly perform the latest procedures. 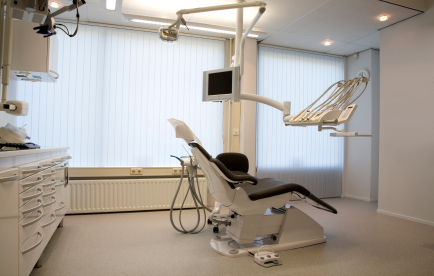 In addition, our practice uses the most advanced dental materials and techniques available. If you are one of the many Comstock Park residents who has dreamed of an esthetic improvement to your smile, we invite you to make an appointment with Stewart and Hull Aesthetic and General Dentistry to discuss a smile makeover. Complete smile transformations are completed as quickly and professionally as possible – sometimes in just one visit! One of our most sought after treatments at Stewart and Hull Aesthetic and General Dentistry is general dentistry and many Belmont, Comstock Park, Grand Rapids, Sparta, Walker and Rockford, MI patients are enjoying a brighter smile because of cosmetic dentistry and teeth whitening. At Stewart and Hull Aesthetic and General Dentistry we have been serving the residents of zip code area 49321 since 1974 and would love to provide you and your family with professional, friendly dental care.